"Here's your pass to the Globe Theater. Service men and women from all over the globe eagerly grabbed their "passes to the Globe Theater and tuned in weekly to hear broadcasts of famous and well done plays. Such greats as Man Called X, Phantom Lady, and The Lady Eve abound on this glorious program. "Just as the Globe Theater meant the best in entertainment since the days of Shakespeare, today it means the best in radio drama. " 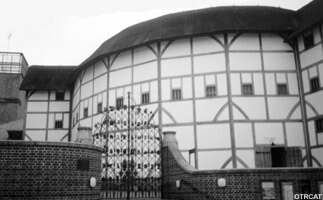 Hosted by Herbert Marshall, Globe Theater performances were highly regarded and well attended by radio listeners everywhere. So put on your best frills and grab your seat next to the orchestra, the show is about to begin! See also: Shakespeare Radio Collection and for more literary-based radio shows, see also: Authors Playhouse, Authors Collection , NBC University Theater,and World's Greatest Short Stories and World's Great Novels. Thanks for the great customer service! You guys really do an exceptional job and I want to thank you for your business offerings. For these reasons you are my go-to shop for OTR recordings. You have a great selection that just keeps getting better all the time with rare, unusual or imported recordings from other countries. Your shipping is fast and you keep a customer informed as to the progress of material being shipping. And I get a real kick from your marketing efforts via your emails—those are always fun to read.